Download "MASTER OF ACCOUNTING. 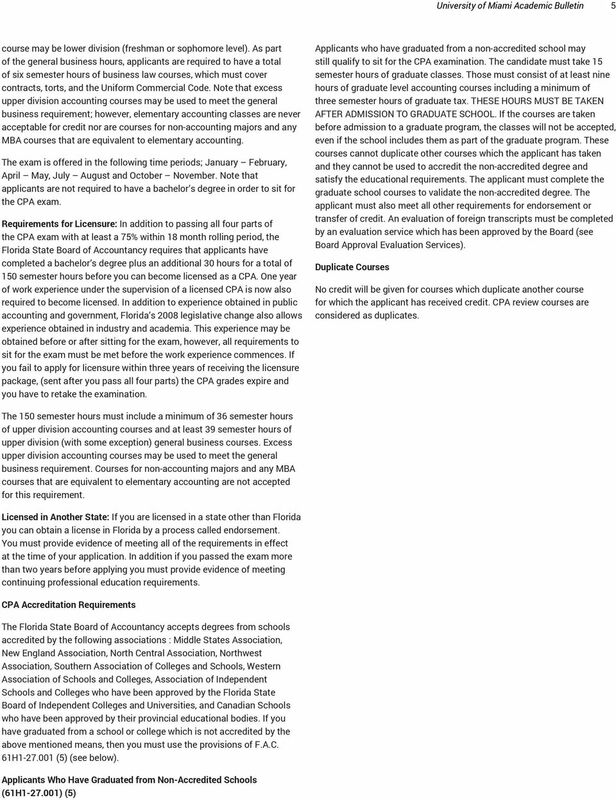 MASTER OF ACCOUNTING (MAcc) and MASTER OF SCIENCE IN TAXATION (MST) Master of Accounting Assurance Track (MAcc- Assurance)"
3 University of Miami Academic Bulletin 3 BTE 613 Business Intelligence Technologies BTE 617 Information Technology Project Management BTE 689 Topics in Computer Information Systems 1-3 Any other electives must be selected in consultation with the Program Director. 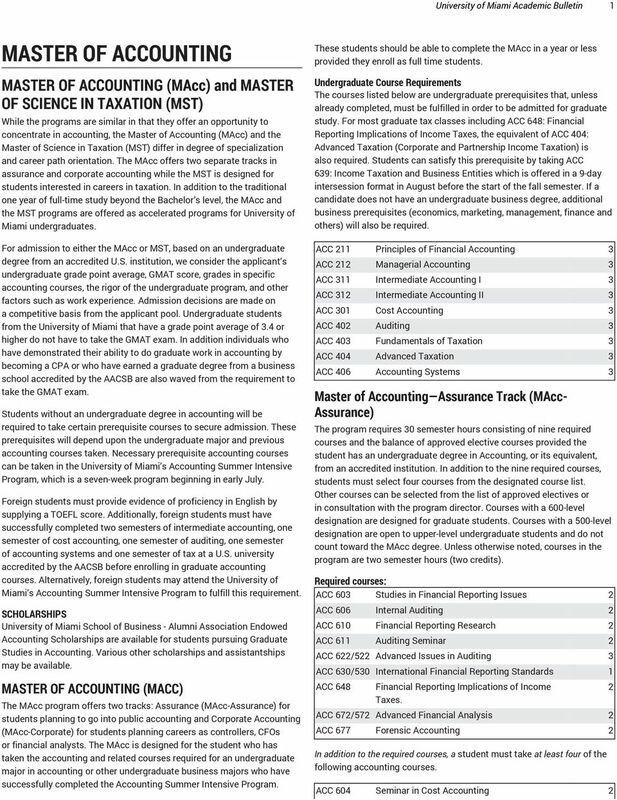 ACCELERATED MASTER S PROGRAMS In addition to offering the Master of Accounting (MAcc) and Master of Science in Taxation (MST) on the usual time frame involving one year of full-time study beyond the Bachelor s level, the MAcc-Assurance Track, MAcc-Corporate Track, and MST are offered as accelerated programs. These programs permit high achieving accounting students who have accelerated their education by taking advanced courses in high school, testing out of classes, taking increased class loads, or going to summer school, to start their graduate work while seniors. The accelerated programs are available only to students who are undergraduate students at the University of Miami. The programs are designed in such a way that students can expect to complete both their Bachelor s and Master s degrees and make significant progress on the CPA exam (if not complete it entirely) within 4½ years. In addition, these programs are extremely price competitive. 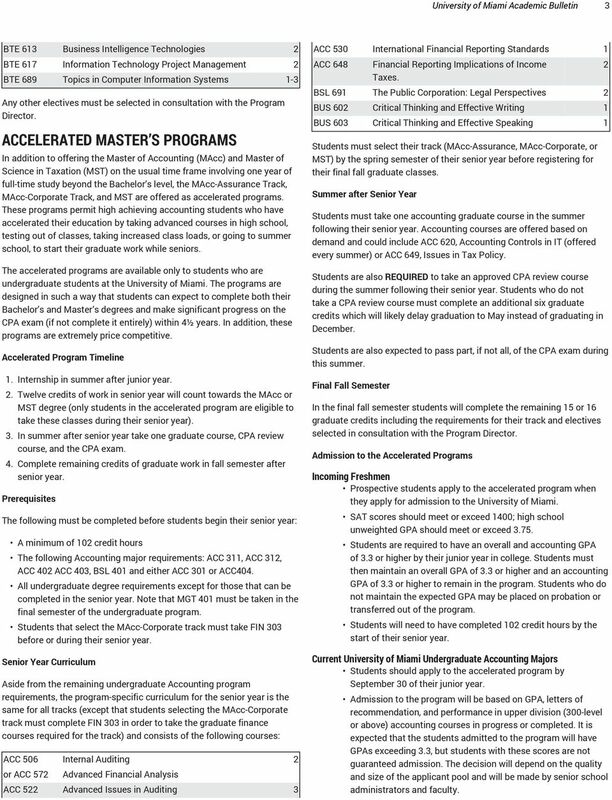 Accelerated Program Timeline 1. Internship in summer after junior year.. Twelve credits of work in senior year will count towards the MAcc or MST degree (only students in the accelerated program are eligible to take these classes during their senior year). 3. In summer after senior year take one graduate course, CPA review course, and the CPA exam. 4. Complete remaining credits of graduate work in fall semester after senior year. Prerequisites The following must be completed before students begin their senior year: A minimum of 10 credit hours The following Accounting major requirements: ACC 311, ACC 31, ACC 40 ACC 403, BSL 401 and either ACC 301 or ACC404. All undergraduate degree requirements except for those that can be completed in the senior year. Note that MGT 401 must be taken in the final semester of the undergraduate program. 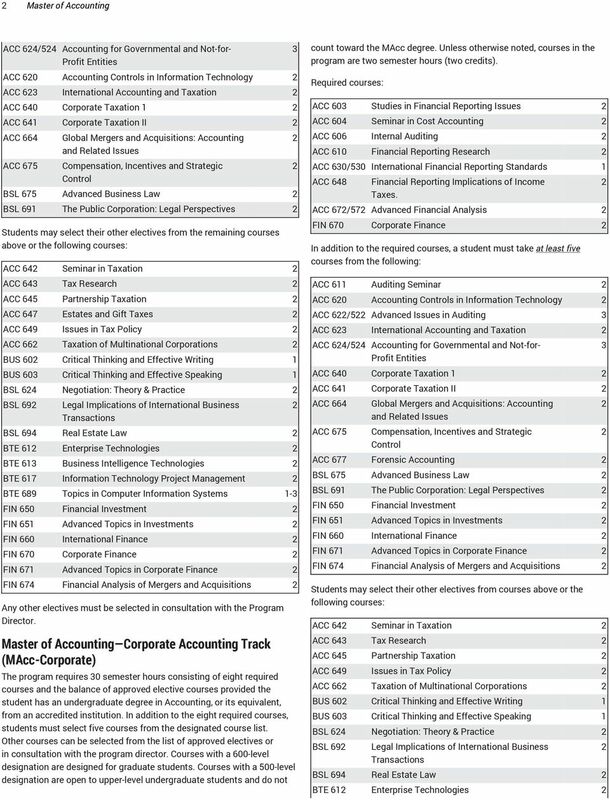 Students that select the MAcc-Corporate track must take FIN 303 before or during their senior year. Senior Year Curriculum Aside from the remaining undergraduate Accounting program requirements, the program-specific curriculum for the senior year is the same for all tracks (except that students selecting the MAcc-Corporate track must complete FIN 303 in order to take the graduate finance courses required for the track) and consists of the following courses: ACC 506 Internal Auditing or ACC 57 Advanced Financial Analysis ACC 5 Advanced Issues in Auditing 3 ACC 530 International Financial Reporting Standards 1 BSL 691 The Public Corporation: Legal Perspectives BUS 60 Critical Thinking and Effective Writing 1 Students must select their track (MAcc-Assurance, MAcc-Corporate, or MST) by the spring semester of their senior year before registering for their final fall graduate classes. 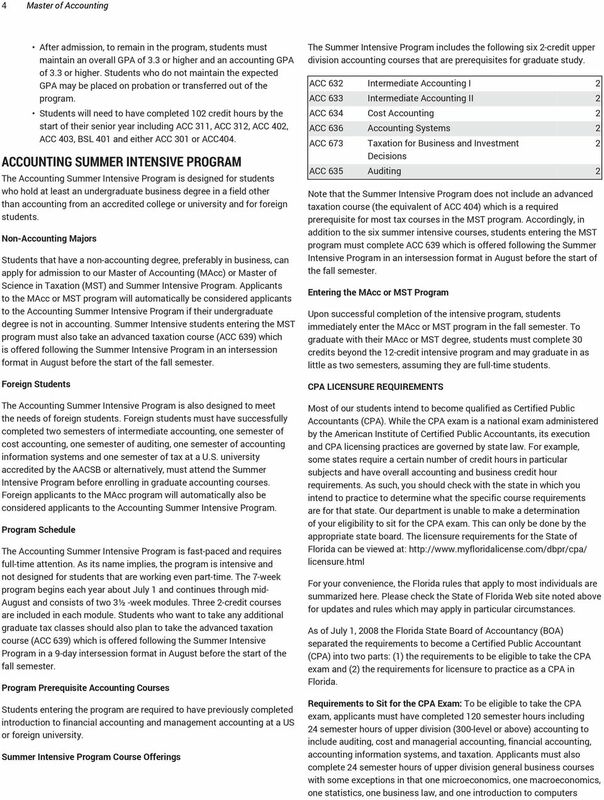 Summer after Senior Year Students must take one accounting graduate course in the summer following their senior year. Accounting courses are offered based on demand and could include ACC 60, Accounting Controls in IT (offered every summer) or ACC 649, Issues in Tax Policy. Students are also REQUIRED to take an approved CPA review course during the summer following their senior year. Students who do not take a CPA review course must complete an additional six graduate credits which will likely delay graduation to May instead of graduating in December. Students are also expected to pass part, if not all, of the CPA exam during this summer. Final Fall Semester In the final fall semester students will complete the remaining 15 or 16 graduate credits including the requirements for their track and electives selected in consultation with the Program Director. Admission to the Accelerated Programs Incoming Freshmen Prospective students apply to the accelerated program when they apply for admission to the University of Miami. SAT scores should meet or exceed 1400; high school unweighted GPA should meet or exceed Students are required to have an overall and accounting GPA of 3.3 or higher by their junior year in college. Students must then maintain an overall GPA of 3.3 or higher and an accounting GPA of 3.3 or higher to remain in the program. Students who do not maintain the expected GPA may be placed on probation or transferred out of the program. Students will need to have completed 10 credit hours by the start of their senior year. Current University of Miami Undergraduate Accounting Majors Students should apply to the accelerated program by September 30 of their junior year. Admission to the program will be based on GPA, letters of recommendation, and performance in upper division (300-level or above) accounting courses in progress or completed. It is expected that the students admitted to the program will have GPAs exceeding 3.3, but students with these scores are not guaranteed admission. The decision will depend on the quality and size of the applicant pool and will be made by senior school administrators and faculty.